The first ever critical edition of the monumental Commentary of St Augustine on the Psalms, a project undertaken by the Austrian Academy of Sciences (Österreichische Akademie der Wissenschaften) and the Patristic Institute at Rome (Institutum Patristicum Augustinianum), has taken yet another step forward. 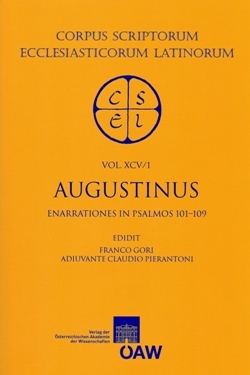 The volume containing Enarrationes in Psalmos 101-109 (CSEL 95/1), edited by F. Gori (University of Urbino; Institutum Patristicum Augustinianum) with the collaboration of C. Pierantoni (Pontifical Catholic University of Chile), has now been published. The project involved the editing and collocation of numerous manuscripts. The study of their relationships revealed that the manuscript tradition had been contaminated, but not to the point of making it impossible to identify the fundamental lines of the most ancient stemmatic relationships. The construction of the text was based primarily on text criticism appropriate to its genre and to the specific forms of the Enarrationes as preached. In fact, the oratorical character of the homilies on the Psalms, their realistically oral quality, along with their spritual and parentic content, are responsible for the great fortune that the Enarrationes enjoyed in the Middle Ages. At the same time, their great circulation and their vitality during this period were also responsible for the instability of the text as witnessed in the numerous variants present in the different branches of the manuscript tradition. These variants, as important and as skillfully crafted as they are, also tax the judgments of the editors in seeking to determine which readings are authentic.